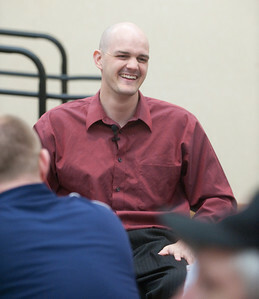 Paralympian's recovery was due to "Mind over Body"
TERRE HAUTE, Ind. - Dave Denniston's life changed in a split second. Denniston, a former Auburn University swimmer who began swimming at age 8, was in top physical form. A world class competitor in the 100 and 200 meter breaststroke events, he was on many national teams, and broke both American and World Records. He had aspirations of being a professional swimmer and representing the United States in the Olympics, with corporate sponsors such as Nike. He attempted to make the USA Olympic team in 2000, but missed the cut. So with youthful determination and a strong body, he set his sights on the 2004 Olympic Games. "Eat, sleep, swim, train," he said. "I did everything I could to make the 2004 Olympic team." But after missing the 2004 U.S. Olympic Team by a hair, his life fell apart. Denniston was without a job and under financial stress. Physically in the best shape of his life, his mental attitude was on the opposite side of the spectrum. "I started getting scared and depressed," he added. But the opportunity to coach in New Zealand came up and he accepted. Before leaving America for at least a couple of years, he decided to spend time at his family's snow-bound cabin in the Wyoming mountains with a friend. A sledding accident on Feb. 6, 2005, forever changed his life. While gliding down a steep hill on a plastic sled, he spun out of control and slammed into a tree, breaking his back and injuring his spinal cord, leaving him paralyzed. His accident occurred in a remote area which made it difficult to receive medical assistance. Denniston laid at the scene for three hours before paramedics on snowmobiles could find them using GPS units. Denniston shared his story recently at Indiana State University in conjunction with Disabilities Awareness Month. "Our bodies are not that strong," he said, recalling the hours he laid in the snow, tasting blood in his mouth and unable to feel his legs and feet. Denniston said the human spinal cord has the consistency of a peeled banana. Dropping a quarter onto the peeled banana, he revealed a tiny dent it left. "All I did was bruise my spinal cord," he said. "But I'm paralyzed from the waist down." The key to life after the accident wouldn't be found in his body, but rather in his mind. "The greatest gift we've been given is our mind," he said, adding the key is to focus on the positive. Negative messages travel slow and bog down the thought process, Denniston explained, so they tend to block out the positive thoughts. "The sooner you focus on the positive, the happier you'll be," he concluded. "Focus on what you can do, don't get wrapped up in what you can't do." With a positive outlook and a willingness to work, he began a new chapter in his life. After surgery to fuse his broken vertebra, rehabilitation and learning to get around in a wheelchair, Denniston learned another valuable lesson -- how the mind, body and attitude develop your character. "Character is who you really are," the 30 year-old said. "It's the stuff that gets you through life." After learning how to swim all over again without the use of his legs, Denniston went on to compete on the U.S.A. Paralympic Swim Team in Beijing last September. "Today I work twice as hard to go half as fast," he says. As Denniston glides across the water during competitions, it's with upper body strength alone. "My upper body is stronger than it's ever been," said Denniston, whose favorite event is the 100-meter breaststroke. But in-season, the Nike-sponsored professional athlete is all business, training six times a week for one to three hours per session. Medicine balls, core work and a host of other core conditioning drills all come into play, he said. Before the accident, Denniston split his training into two sessions per day. Since he now relies solely on his upper body to swim, he noted it's hard on his shoulders, so he goes twice as long once a day. "I love swimming more than ever now," he said, describing the freedom of weightlessness and the soothing feeling the water has on his back. "It's a big part of who I am," he said. He hasn't given up hope that he will walk again. After the accident he went to California, where he spent 21/2 years working harder than he ever had training for the Olympics just for the chance to walk again. The treatments were extreme and not covered by his insurance, but for the chance to walk again he worked and spent $3,000 a month. On the one-year anniversary of his accident, he took 163 steps. At the wedding of his friend, Andy, with whom he'd been sledding when he injured his back, he stood for the entire 20-minute ceremony. Denniston, who lives in Longmont, Colo., enjoys outdoor sports -- fishing, shooting clay pigeons and white water rafting. "We took a seven-day trip down the Grand Canyon," he said of one recent adventure. "It was a blast." Denniston also shares his experiences of hope, positive attitude, and encouragement with various groups around the nation in addition to conducting swim clinics for children. Since he worked with youth and trained others prior to his accident, Denniston said a coaching career might be in his future. "I enjoy working with kids," he said. Denniston and his father are currently working on a motorized engine for his wheelchair so he can climb the mountains. A sledding accident changed Dave Denniston's life forever, and in the process made him a better person.